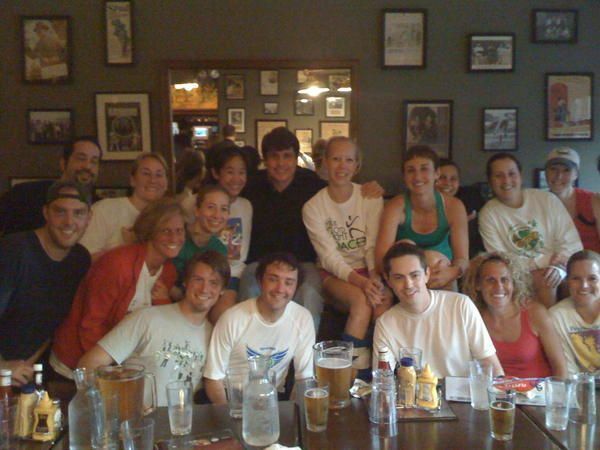 a Monday night run, welcomes all types of runners (Photo courtesy of Chicago Beer Runners). In 2008, Rogers Park resident Brad Perkins searched the Internet for a running group to keep him in shape for races. One match stood out in particular -- the Chicago Beer Runners. Every Monday and Wednesday, the group of 20 to 25 runners meet at Southport Lanes in Lakeview at 6:30 p.m., their meeting place for the past three years. As its name implies, the group mixes two incongruous passions -- distance running and beer drinking. “It’s a great location. They’re very welcoming and they all know us here,” Perkins said. The group is not hard to spot in the bar. Sitting by the door with duffel bags, tennis shoes, and layers of clothing, members laugh like old friends and welcome first timers. “Running, beer, and fun people. It really is so simple,” said participant John Hanauer. Once everyone has arrived and dropped off the gear, the group heads out on a set route of three to five miles at varying paces. Perkins sees having a known route for everyone as an advantage for those not familiar with the area. “It’s nice to have a set route because when we come back if someone isn’t there we always know where to look,” said Perkins. 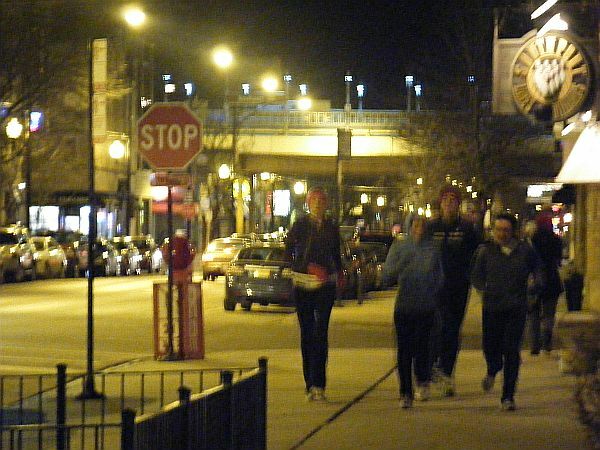 Along with their weekly runs, the Chicago Beer Runners also participate in pub runs, five bars in five miles, twice a year. In February, over 30 members attended the “Pub Run 6” and in April some of the group will head to Nashville to run the Rock n’ Roll half marathon. Hear Mary Paracka tell how she met her future husband through the running group below. One member, Tim Carr, recalls his favorite memory happening at the Kenosha Half Marathon he ran with Perkins. Unfortunately for him, the bad luck continued on race day. While many of the members are dedicated runners, they’re welcoming of everyone. Runners like Perkins and Carr both use Beer Runners as a change of pace to their weekly routine. “Sometimes I come to Beer Runners saying I’m going to run a shorter route really hard and other times and I’m just going to lay back, said Tim. “It gives you this nice change of pace to your normal workout routine”. Whether you’re there to meet friends or in some members’ case, your future spouse, Brad Perkins sees the evolution of Chicago Beer Runners as boiling down to “comradery”.